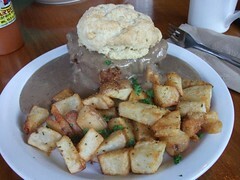 Our next stop on the food tour of Portland was The Farm Cafe. We spent ages debating whether to go there or not since there so many vegetarian places in Portland that we could have tried. But after a long day walking miles around the city, we decided to walk the 2 minutes there from our hotel and the tofu masala reached out and yanked me in. 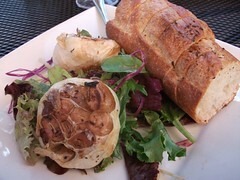 This was my roasted garlic and bread starter. It was lovely but we could probably have had it between us. There were a couple of vegetarian dishes but only this one vegan dish plus one vegan main course. Matthew eats dairy so it didn’t really bother us but bear in mind that if you’re both vegan you’ll probably end up eating the same dish. 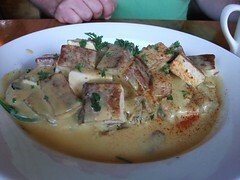 However, when the dish is as good as the tofu marsala you won’t mind getting two plates. There’s a version of it in Yellow Rose Recipes, based on The Farm’s version, and I’ve made and loved it, so I was really keen to try this one. The tofu was locally made and the breadcrumb coating was the crispiest I’ve ever tasted anywhere. 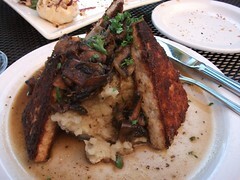 The tofu melted in my mouth, and roast garlic mashed potatoes and mushroom marsala sauce were perfect accompaniments. 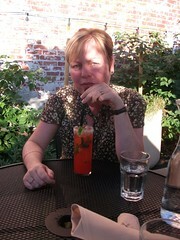 We sat outside in the sunny garden and the atmosphere was busy and efficient. I loved this place; I guess Portlanders have a huge range of places to eat but if I lived there I’d be campaigning for an extra vegan main course so that 2 vegans could eat there without having to duplicate the order. 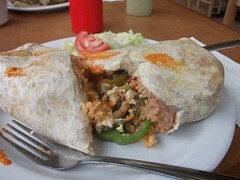 Our next stop was Los Gorditos. We were running out of evenings so we decided to go for breakfast. There’s nothing we like better than spicy food at breakfast so this was no problem. I had heard mixed reviews of this place and we were a bit disappointed and glad we didn’t waste a dinner there. There’s a huge vegan menu but everything on it seems to be more or less the same dish. We both got a vegan breakfast burrito but I chose soy curls and Matthew had chorizo. Mine was a bit bland and Matthew’s had an overpowering taste of cloves from whatever chorizo they used. It was all OK but didn’t blow us away. On our last evening we were faced with lots of difficult decisions. We were pretty much set on going to Bete-Lukas but I was hankering after trying the options at the Hawthorne food cart pod. 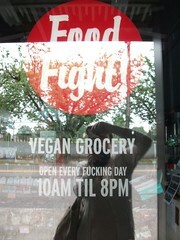 I’d read of vegan poutine, amazing wood fired pizza and deep fried pies. I couldn’t leave Portland without it. 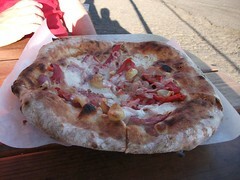 The pizza, from Pyro pizza, was indeed amazing. How on earth they can produce pizza of that quality in a cart baffles me. This was their recommendation, roasted garlic and peppers with daiya cheese. It may just be the best crust I’ve ever eaten. 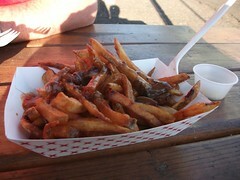 This was the vegan poutine from Potato Champion, only they’d run out of vegan cheese. I was upset at first but the fries and gravy were so good I found consolation. We also shared a chicken pot pie from Whiffie’s but I didn’t get a picture. 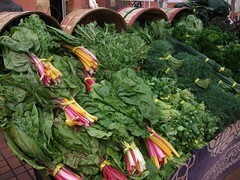 We could have had a sweet or savoury crepe from one of the other carts too but we were full. 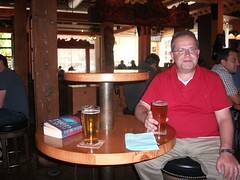 I adored the Hawthorne food pod; the only thing I’d alter is the chance to get a beer to have with your food – I didn’t see anywhere to get it so I don’t think you can. On our last day we wanted to get a really good breakfast so we wouldn’t need to get anything until the evening. We went to VitaCafe and it was an excellent choice. It took us ages to decide what we were having. I wanted one of everything. In the end I went for the Sloppy Biscuit Sandwich, which was just amazing – light biscuits stuffed with tofu, turkey and a bit of cheese with lovely salty potatoes and a fantastic savoury gravy. Matthew had the Faux Tofurkey Florentine which was English muffins with tofu, turkey, spinach and an excellent hollandaise. This was an amazing place to go for breakfast and it was a wonderful last meal and goodbye to Portland. As you can tell, we had a fantastic 6 days eating our way round the city, from food cart to raw food, from high end Italian to Egg McMuffins. I come away more jealous than ever of those lucky people who live there. 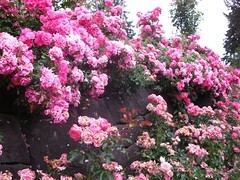 I really want to go to portland! This post made me drool! 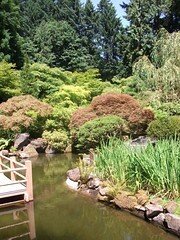 I’m longing for another trip to Portland. I’m sorry Los Gorditos was a bit disappointing. We went for lunch and really liked it. I will need to try some of your picks.